It is not easy for a woman to enter the closed circle of rock idols. And even less in that, jealously guarded, stars. Kim Wilde has done it in less time than it takes to say her name. It is true that she has something to keep since her father, Marty Wilde, was himself one of the most influential singers in England in the early sixties. With Marty the father, and Ricki the brother, who composes lyrics and songs, Kim has good arguments to promote both her beautiful voice and her devastating look. 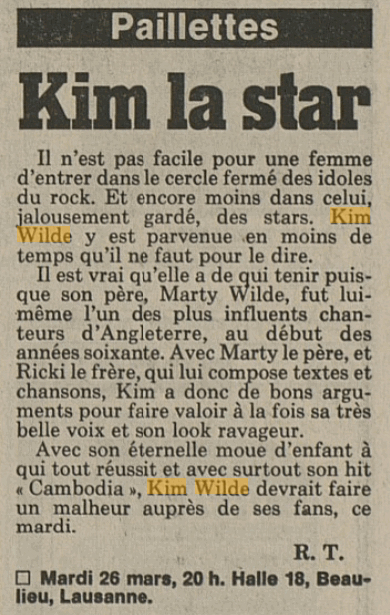 With her eternal pout which wins over everyone and especially with her hit 'Cambodia', Kim Wilde should be a fortune with her fans on Tuesday. Kim Wilde: "I need to be noticed"